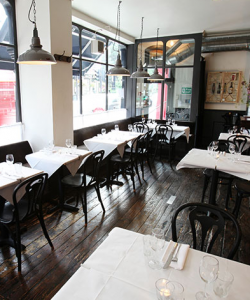 Mute is set to commence restaurant soundproofing at Trullo in Islington, in order to improve restaurant acoustics. Trullo is an Italian restaurant, boasting an award for best young chef and offering a dining experience lauded by the likes of Giles Coren and Jay Rayner. Mute Soundproofing® will design and install a soundproofing system to improve restaurant acoustics. This noise solution will be applied in and around the busy service area to enhance interior acoustics. The result will be a more intimate dining experience for their customers. This entry was posted on Sunday, May 5th, 2013 at 9:38 am	and is filed under Soundproofing News. You can follow any responses to this entry through the RSS 2.0 feed. Both comments and pings are currently closed.